Last week, when Marco Rubio charged Donald Trump with illegal labor practices, Trump dismissed the claims as old news, leading Rubio to respond, “I guess there’s a statute of limitation on lies.” Meanwhile, in a New York court, Trump had raised an actual statute of limitations defense to fraud claims brought by New York attorney general Eric Schneiderman against Trump University. Today, Super Tuesday, a New York appeals court unanimously rejected Trump’s argument. In 2004, Trump, along with respondent Michael Sexton and a nonparty individual, incorporated Trump University LLC as a New York limited liability company. Trump University purported, by way of seminars and mentoring programs, to instruct small business owners and individual entrepreneurs in real estate investing. By letter dated May 27, 2005, the New York State Department of Education (SED) notified Donald Trump individually, Sexton, and Trump University that they were violating the New York Education Law by using the word “University” when it was not actually chartered as one. Likewise, SED notified these respondents that Trump University was also violating the Education law because it lacked a license to offer student instruction or training in New York State. SED stated, however, that Trump University would not be subject to the license requirement if it had no physical presence in New York State, moved the business organization outside of New York, and ceased running live programs in the State. In June 2005, Sexton informed SED that Trump University would merge its operation into a new Delaware LLC, and would indeed cease holding live programming in New York State. However, the Attorney General alleges, Trump University failed to abide by any of these conditions. 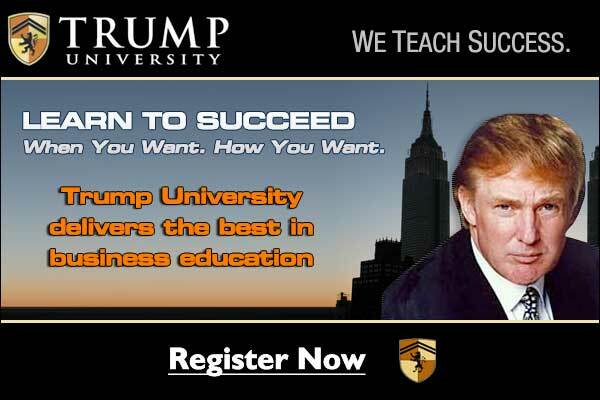 To the contrary, it is alleged that, despite Sexton’s assurances to the Attorney General, SED learned in 2009 through newspaper advertisements and a student complaint to the New York State Attorney General that Trump University was continuing to provide live programming and instruction in New York without obtaining proper licensing or moving its operations out of New York. In March 2010, SED sent Trump University another letter demanding that it cease using the word “University” in its name. In May 2010, five years after SED had informed respondents that they were obliged to drop the word “University,” Trump University filed a certificate of amendment to its Articles of Organization, thus formally changing its name to TEI. In August and September 2010, SED once again informed TEI that the company needed a license to operate, which it still did not have despite having been notified in 2005 that its failure to obtain a license violated New York State law. On October 7, 2010, Sexton informed SED that TEI had ceased operations. … In its supporting affirmation, the Attorney General alleged that between 2005 and 2011, respondents operated an unlicensed, illegal educational institution. Further, the Attorney General stated, through various fraudulent practices, respondents intentionally misled more than 5,000 students nationwide, including over 600 New York residents, into paying as much as $35,000 each to participate in live seminars and mentor programs that the students thought were part of a licensed university. However, the Attorney General averred, Trump did not handpick the instructors; indeed, only one of the live event speakers for Trump University had even ever met Donald Trump. Nonetheless, some students purchased seminars on the basis of their belief that Trump had approved each instructor. In an affidavit submitted to the Attorney General, one student stated that he “had some trust in the program because it was run by Donald Trump” and was “led to believe that…based on Trump’s marketing materials, the course professors had been handpicked by Donald Trump.” Similarly, the Attorney General stated, Donald Trump never participated in the creation of any instructional content and never reviewed any curricula. The Attorney General further maintained that the instructors had been inadequately vetted and in fact had little or no experience in real estate investing, instead having prior work experience such as food service management and graphic design. The Attorney General also averred that individual respondents Donald Trump and Michael Sexton were each personally involved with the founding of Trump University. Trump, the Attorney General maintains, conceded that he had “significant involvement with both the operation and overall business strategy of Trump University,” including “attending frequent meetings” with Sexton to “discuss Trump University operations.” Further, Trump’s photographs and signature appeared on all of Trump University’s advertising; according to testimony from Sexton, Trump personally reviewed and approved all the ads that were in the newspapers…. The New York court rejected Trump’s claim that a three-year statute of limitations applied to the fraud charges in the case. Trump’s lawyer told the New York Post that he disagreed with the opinion and planned a further appeal.